CALGARY, ALBERTA--(Marketwired - Jan. 27, 2017) - Today, AltaGas Ltd. ("AltaGas") (TSX:ALA) celebrated the grand opening of its Pomona Energy Storage Facility at the site of its existing Pomona generation facility in the East Los Angeles Basin of Southern California (the "Facility"). At 20 megawatts (MW) of electricity storage capacity, it is currently the largest battery storage facility in operation in North America. 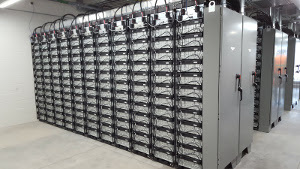 In addition to AltaGas constructing the Facility on-time and on-budget, the company completed construction of the lithium-ion battery system in less than four months, which ranks as one of the fastest deployments of battery storage capacity on this scale in the industry to date. 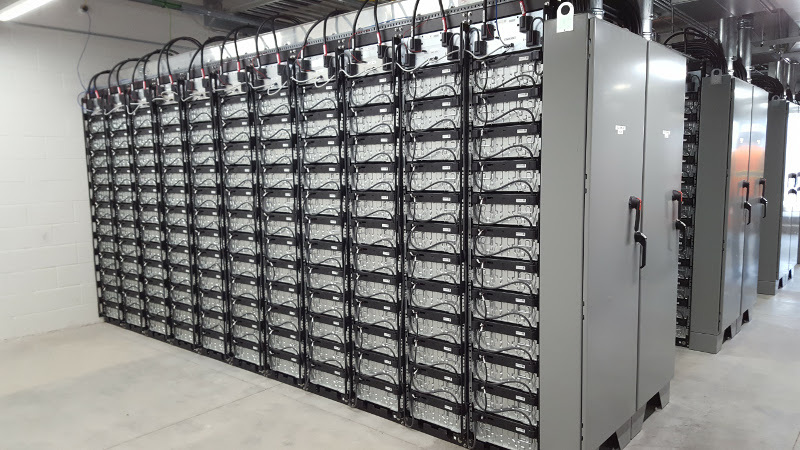 "We are pleased to advance our California power strategy by bringing 20 MW of battery storage online within a precedent setting four months," said David Harris, President and CEO of AltaGas. "Providing energy from electricity stored in lithium-ion batteries provides clean reliable energy that complements California's renewable energy portfolio while adding to the versatility of our asset base which is well situated for pursuing other energy storage developments." In August 2016, AltaGas' subsidiary, AltaGas Pomona Energy Storage Inc., signed a 10-year Energy Storage Resource Adequacy Purchase Agreement ("ESA") with Southern California Edison ('SCE") for 20 MW of energy storage at AltaGas' existing Pomona facility. Under the terms of the ESA, AltaGas will provide SCE with 20 MW of resource adequacy capacity for a continuous four hour period, which represents the equivalent of 80 MWh of energy discharging capacity. AltaGas will receive fixed monthly resource adequacy payments under the ESA and will retain the rights to earn additional revenue from the energy and ancillary services provided by the lithium-ion batteries. Commercial operations of the Facility under the terms of the ESA began on December 31, 2016. "Offsetting periods of peak power with 80 MWh from battery storage is enough power to feed the electricity needs of approximately 15,000 homes over the four-hour period," said Harris. The Facility features industry leaders in the energy storage industry including Samsung SDI, Parker Hannifin, Power Engineers and Greensmith Energy Management Systems. ARB was the General Contractor with support from the California Building Trades. AltaGas' other assets in California include six natural gas-fired power generating facilities, as well as development projects. AltaGas is an energy infrastructure company with a focus on natural gas, power and regulated utilities. AltaGas creates value by acquiring, growing and optimizing its energy infrastructure, including a focus on clean energy sources. This release contains forward-looking statements. When used herein, the words "may", "would", "could", "can", "will", "be", "intend", "possible", "plan", "develop", "anticipate", "target', "believe", "seek", "propose", "continue", "estimate", "spur", "expect", and similar expressions, as they relate to AltaGas or an affiliate of AltaGas, are intended to identify forward-looking statements. In particular, and without limitation, this release contains forward-looking statements with respect to AltaGas' ability to advance its California power strategy, the ability of electricity stored in lithium-ion batteries to provide clean reliable energy that compliments California's renewable energy portfolio, the ability of the Facility to add versatility to AltaGas' asset base, AltaGas' asset base being well situated for pursuing other energy storage developments, AltaGas ability to earn additional revenue from the energy and ancillary services provided by the Facility the provision of 20 MW of resource adequacy capacity to SCE under the terms of the ESA and the ability of the Facility to provide the equivalent of 80 MWh of energy discharging capacity. These statements involve known and unknown risks, uncertainties and other factors that may cause actual results or events to differ materially from those anticipated in such forward-looking statements. Such statements reflect AltaGas' current views with respect to future events based on certain material factors and assumptions and are subject to certain risks and uncertainties, including without limitation, changes in market, competition, governmental or regulatory developments, general economic conditions and other factors set out in AltaGas' public disclosure documents. Many factors could cause AltaGas' actual results, performance or achievements to vary from those described in this release, including without limitation those listed above. These factors should not be construed as exhaustive. Should one or more of these risks or uncertainties materialize, or should assumptions underlying forward-looking statements prove incorrect, actual results may vary materially from those described in this release as intended, planned, anticipated, believed, sought, proposed, estimated or expected, and such forward-looking statements included in, or incorporated by reference in this release, should not be unduly relied upon. Such statements speak only as of the date of this release. AltaGas does not intend, and does not assume any obligation, to update these forward-looking statements. The forward-looking statements contained in this release are expressly qualified by this cautionary statement.